This article was presented as a paper at the First International Wildlife Management Congress, held in Costa Rica in September 1993 and sponsored by the Wildlife Society. Pant of it was also published in Unasylva, a periodical prepared in the FAO Forestry Department. Today, nearly all countries in Latin America and the Caribbean have systems of protected areas, and the management of wildlife is viewed as a legitimate land use. Government policies in most countries now reflect a conviction that protected wildland areas and wildlife can contribute to overall socio-economic development. The conservation of biological diversity and the provision of a wide range of products and services from wildlife are generally accepted as desirable national goals. The question now facing policy-makers and managers of protected wildlands in the region is not whether they will have protected areas, but rather how many will be established, and of what size and where; who will manage and protect them; how much they will cost; and how adjacent communities can better benefit from them. With wildlife, the question is not whether species should be conserved, but rather how they can be better managed to provide products and services on a sustainable basis, particularly for rural populations. For many years, the countries of Latin America and the Caribbean have received technical assistance as well as bilateral and multilateral financial assistance from developed countries. However, the countries of the region have become aware that, despite the benefits of this assistance, imported technology often does not completely meet local requirements and realities. Dependence on foreign assistance can also lead to inconsistent progress: in times of economic recession Of in the face of political disagreements, external aid can dry up, leaving the developing country with half-achieved goals. These concerns, combined with the need to circulate the accumulated knowledge and experience more widely throughout the developing countries, led to the establishment of a collaborative concept called Technical Cooperation among Developing Countries (TCDC). The principles of this cooperative effort were established by the 138 nations represented at the United Nations Conference on Technical Cooperation among Developing Countries held in Buenos Aires, Argentina, in September 1978. As defined by the Conference, TCDC is "the deliberate and voluntary sharing of experience between two or more developing countries for their mutual development". The participants at the Buenos Aires conference stressed that TCDC activities, to the greatest extent possible, should be initiated, organized, managed and financed by the partner developing countries themselves. However, it was also recognized that the developed countries, and particularly international organizations, could and should provide assistance in getting specific programmes off the ground. In this context, the governments of the countries of the Latin American region called upon FAO to assist in the application of this new mode of cooperation. In 1979, with the assistance of the Regional Office for Latin America and the Caribbean, they began to establish technical cooperation networks in a number of priority areas. Since then, some 20 TCDC networks have been established in the region. Within the forestry sector, networks have been established in watershed management, agroforestry, protected areas and wildlife and in dendro-energy. The TCDC networks enable national institutions to exchange experiences and knowledge using their own human, financial and technical resources. Through this mechanism they can act in a coordinated manner on research and development of technologies to solve problems of common interest. They can complement each other's technical capabilities, thus enabling a more efficient utilization of resources while avoiding unnecessary duplication. The TCDC networks also allow countries with more experience to share their knowledge with countries less advanced in a particular technical area. The networks function through such activities as technical meetings, round tables and workshops; study trips, observations and technical exchange; training courses, seminars and other forms of group and individual training; exchange of information, publications, audiovisual material, etc. ; and cooperation in the identification and design of pilot and demonstration programmes. Programme development and implementation generally consist of a thorough study of the situation in each country by the national institutions concerned with the subject, followed by a workshop for specialists from the countries to analyse the situation, as a group, in the context of the region or subregion. At the workshop, the participants reach collective conclusions, suggest viable solutions and establish a work programme for collaborative action among the countries. The cayman (Caiman crocodilus) is the Latin American representative of the crocodile. Reaching an average length of some 2 m, these semi-aquatic reptiles can be found in almost all water-rich environments of Latin America, from the swamp-grasslands of Colombia Venezuela to the humid tropics of the Amazon. Even though legislation aimed at species conservation currently bans the hunting or sale of cayman in almost all countries of the region, an estimated 1 millon cayman skins find their way on to the international market each year. Unfortunately, in addition to seriously reducing the; resource, this illegal trade brings only: a minimal income to indigenous hunters; most of the profits e enjoyed by intermediary agents and manufacturers of; finished products. The rational utilization of this resource could have significant benefits for a large portion of the rural population. A fair share of the value of the skins could bring much needed income, and the meat could provide dietary protein requirements. In addition to its socio-economic value, the cayman also plays an important role in maintaining the ecological balance of the water systems where it is found. It is instrumental in keeping down the population of Serrasalmus sp. (piranhas), for example, which otherwise would decimate other aquatic species. In response to a clear need to improve the conservation and development of wildland areas and wildlife in the region, and the confidence of governments that this could be accomplished most effectively through the sharing of combined technical skills and experience, a round table meeting was convened in June 1983 at the FAO Regional Office for Latin America and the Caribbean in Santiago, Chile, with the participation of representatives from eight countries. Following an analysis of common problems related to wildland areas and wildlife management in the region, the participants agreed to establish the Latin American Technical Cooperation Network on National Parks, Other Protected Areas and Wildlife. Each country designated a national coordinating institution, and a regional coordinator was elected. The FAO Regional Office was asked to assist in organizing the network and to serve as technical secretariat. The Capybara (Hydrochoerus sp.) is the world's largest living rodent. When fully grown, it may reach a length of 1.3 m and weigh up to 50 kg. Semi-aquatic in nature, the Capybara frequents the banks of lakes and rivers in Latin America from Panama to northern Argentina, feeding on water plants and tree bark. In fact. the word Capybara means "master of the grasses". The excellent nutritional qualities, good flavour, smell and texture of capybara meat, combined with the gentle, easily domesticated nature of the animal, have given it a high value in local communities. Capybara leather is tanned for a number of local uses, and it is also used commercially in the production of bags and gloves. The tat of the animal is used in the preparation of medicinal products because of its high iodine content. The wide distribution of Capybara throughout the region, as well as its large size and the ease with which it is captured and bred in captivity, favours its sustained use as a source of food and income for rural people over a large part of Latin America. The general objectives of the network are to collaborate in the effective management of protected areas and wildlife; to facilitate the establishment of a regional database on biotic resources; to collaborate in protecting an adequate representation of biological diversity; to improve personnel training for the management of protected areas and wildlife; and to cooperate in improving the contribution of protected areas and wildlife to better socio-economic conditions. To ensure a fluid interchange of information among the countries, the network has developed a communications programme that includes the preparation, publication and distribution of technical documents; the editing of a technical bulletin and circular newsletter; a computerized registry of specialists and institutions; the exchange of national technical papers; and the exchange of specialists, both on study visits and to provide technical assistance. The priority areas of the network are national systems of protected wildlands; intercountry programmes on protected areas and wildlife in major biogeographic regions; protected border areas; research in wildlife and protected areas; in situ conservation of genetic resources; local participation in the management of protected areas; environmental interpretation; and the management of wildlife for rural development. Within the area of wildlife, among the various options available, a decision was made to concentrate efforts on the utilization of wildlife for rural development. Although wildlife has been traditionally important as a source of nutrition and income in Latin America, until quite recently the management of wildlife for sustained production, particularly for the benefit of rural populations, has not received sufficient attention. With some notable exceptions, for example the vicuña in Peru, efforts at wildlife management for local utilization have been modest undertakings covering a limited number of species. Most management efforts have been directed at commercial and scientific undertakings, as well as sport hunting and the capture of live animals for sale. Furthermore, the limited amount of expertise that does exist at the national level has not been exchanged or made available among the concerned institutions in the region. In spite of the lack of experience, however, many countries have recognized the need to increase the sustained productivity of wildlife and have initiated programmes to manage wildlife for conservation and utilization under both natural and semi-captive conditions. Following an analysis of the opportunities and limitations facing wildlife management in the region, particularly in those sectors that were receiving the least attention, the participants in the TCDC network decided to develop a special action programme to promote wildlife management for rural development. To make the greatest contribution with the available resources, it was decided that work should be initiated with a limited number of those species that had demonstrated the greatest potential for sustained-yield management and could provide an additional source of food and income for rural communities. A survey of national wildlife management projects and programmes was conducted as a first step. Next, criteria were developed to ensure that species selected could withstand sustained utilization and were, or could be, of long-term socio-economic importance to the rural community. · could provide work opportunities for the rural population. Current information was collected from management institutions and experts in each country covered species for which significant studies and projects on sustained-yield production under either natural or semi-captive conditions were under way. From this, a preliminary selection of key species (genera, in some cases) was made. 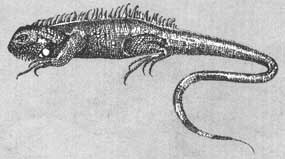 Different species of iguanas of the genera Iguana, Ctenosaura and Tupinambis have economic value for their skin meat and eggs and are exported alive as pets. The white iguana meat is much appreciated and often eaten by farmers. The fat which is believed to have medicinal value and the eggs are eaten as well. Iguana skin is used for the fabrication of decorations and shoes and is exported to Europe where all kinds of objects are made out of the already tanned skin. The iguana species are distributed widely in Latin America from Mexico to Argentina and live in tropical and subtropical vegetation zones. Being omnivores they eat insects as well as small animals fruits and vegetable matter. Although the breeding of iguanas in captivity is still in its infancy considerable efforts are currently under way to develop this area especially in Central America. Subsequently, in October 1985, the network organized a workshop of experts from the participating countries. The participants reviewed the information available, formally approved species selection and began to formulate management guidelines. In the spirit of TCDC, the workshop was hosted by the National Council of Science and Technology and the National Agrarian University at La Molina, Peru. 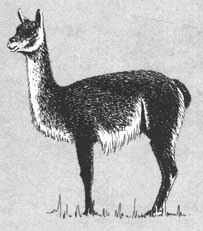 The guanaco (Lama guanicoe) is one of two wild llama species and is widely distributed in Latin America from the northern tip of Peru to Tierra del Fuego in the extreme south. Guanacos live in widely varying conditions from sea level up to an altitude of 4 500 m and hi arid as well as humid zones. However they do not exist hi tropical or temperate rain forests. 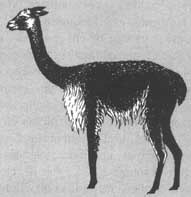 Traditionally Guanaco meat was eaten by rural people who used the hides for clothes. Nowadays the species is threatened since high hunting pressure is directed towards young guanacos whose skin is still fine. These skins are used for bedspreads called quillangos and blankets. etc. Guanaco wool which is of interior quality to that of the vicuña is used for all kinds of textiles Guanaco meat is eaten as dried meat and is a so used in salads. The workshop participants selected capybara, cayman, guanaco, iguanas, nutria, river turtles and vicuña as the seven species or groups that best met all criteria. 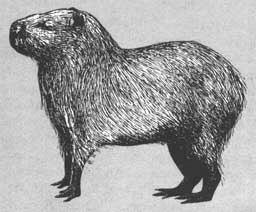 In view of the limited resources available, however, they recommended that initial work be concentrated on capybara. As many of the countries with capybara resources were also concerned with the management of cayman and river turtles, and several institutions were working on all three, it was decided that it would be most efficient and effective to direct activities towards the three species. Each has a long history of traditional use, especially by rural populations, and all are important sources of animal protein and of products for which there is significant demand in national and international markets. To develop specific management guidelines for the three species, a workshop was organized in December 1987 that brought together more than 50 knowledgeable and experienced specialists in the Latin American region. Because of its experience in the management of capybara, the University of São Paulo, in Brazil, was selected as national organizer and venue of the workshop. The FAO Regional Office provided technical and financial support through the FAO/United Nations Environment Programme (UNEP) Project on Wildland, Wildlife and Protected Areas in Latin America. 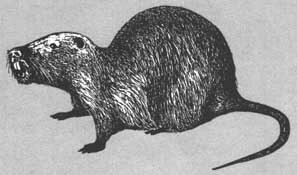 The ability of the nutria or coypu (Myocastor coypus) to adapt to a wide range of temperatures allows its extensive distribution. In Latin America. these aquatic rodents can be found in southern Brazil and southern Chile, Argentina, Paraguay and Uruguay, where they frequent river banks, brooks and lagoons. Nutrias are nocturnal animals but they also show some activity during the day. Their principle foods consist of reeds, roots and seeds of water plants. Although the meat of the nutria was once eaten by indigenous peoples, today the species is hunted only for its hide. Some experiments with breeding the species in semi-captivity have been carried out in Latin America. At the workshop, various aspects of the selected species were discussed, such as biology (feeding, reproduction and sanitation); commercialization (value of meat, skins and other products); social, economic and cultural implications; legal status; conservation considerations, including the role of protected areas; research priorities; and institutional aspects, including the need for training in management and conservation. General management guidelines were drawn up for each species, and numerous technical aspects requiring follow-up action through the network were agreed upon. Although captive breeding has not proved to be economically viable. protection of nesting sites could quickly restore populations to levels adequate for sustainable use, since turtles lay annual clutches that often number more than 100 eggs, depending on the species. As in the case of crocodiles, eggs and young arc particularly vulnerable, but as adults the turtles have very few natural enemies. except fur humans. The workshop noted that specific legislation would be needed by most countries to regulate cayman utilization. A basic consideration in the management of cayman (and other crocodilians) is whether to engage in extensive, i.e. in situ, or intensive, i.e. captive, breeding schemes. At present, most of the countries in the region are experimenting with some form of captive rearing, either with eggs and young collected in the wild or with captive breeding animals. Venezuela has shared its experience in this area with the other nations. Cuba, on the other hand, has considerable experience in the captive breeding of crocodiles, and has prepared, with support from the network, a project to establish a regional centre to train technicians in the management of this important resource. The workshop also established research priorities for each of the species. For cayman managed under natural conditions, for example, research is needed regarding the taxonomic problems of the species and subspecies; the range and distribution of the species; efficient methodologies for counting wild populations; and the influence of territoriality on management. Based on these priorities, research activities have been divided among the member countries according to the expertise available; the resulting information will be distributed throughout the region. After having focused on the first three species, the network has recently begun to give attention to the management of the green iguana (Iguana iguana). Traditionally the species has played an important role in the daily life of local communities throughout the region. For centuries, the meat and eggs of green iguanas were an important part of the local diet and the skin was used for all kinds of objects. However, as a result of deforestation, overhunting and live capture for export as pets, populations of green iguanas have declined and the species is now endangered in several Central American countries. Programmes have been developed in a number of countries where green iguanas are managed in captivity, semi-captivity and in their natural habitat. Feasibility studies on the commercialization of the species and its products are currently being carried out, and projects aimed at the reproduction of the species, particularly for local community use, have been implemented. To exchange information, a technical workshop on the management and rational use of the green iguana was organized by the network in Managua, Nicaragua, in September 1992. Specialists from 12 countries in the region participated. The workshop established recommendations for different management alternatives for the iguana and emphasized the need for socio-cultural studies. It also recommended the establishment of a database on technical, biological and legal aspects of the species' management and stressed the need for increased information exchange among the countries of the region. The vicuña, (Vicugna vicugna), one of two wild llama species, exists only in tour Latin American countries (Argentina, Bolivia, Chile and Peru), where it lives at altitudes of over 3 000 m in the Andes mountains. These areas permit limited reproduction of (he species because of their extreme climatic circumstances. As a result of little rainfall (less than 500 mm per year) and intense solar radiation. up to 40 percent of the newborn do not survive. Besides these severe natural circumstances. vicuña populations suffer from human pressure. Large pans of their natural habitat are now used for agriculture and cattle farming. Currently, vicuñas are protected by law in all the four countries where they still exist. Although the meat, skin and skeleton have been utilized traditionally, it is the vicuña wool in particular that has enormous value. Vicuña wool is said to be the best and finest wool in the world and its price easily reaches US$300 per kilogram. An exciting outcome of the network has been the acceleration of direct technical exchanges between countries of the region. Brazil, for example, has hosted experts from several countries for study tours on captive breeding of capybara. On the other hand, an expert from Venezuela has trained Argentinian experts in sustained-yield management of capybara under natural conditions. Technical assistance exchanges are also being carried out on other aspects of wildlife management. Some of these have been very specific in focus; for example, an expert from Costa Rica helped Chile with a plan for the management of a rare hummingbird on the Juan Fernández Islands; and Argentina provided assistance to Chile in the identification of river-otter habitats. Other initiatives have been much more general; for instance, a specialist from the University of Valdivia in Chile was sent to assist the Government of Uruguay in the development of a system of parks and protected areas. Areas protected for their cultural importance are also receiving attention; for example, Colombia has assisted Costa Rica in the planning of a historical monument. Many other activities in a wide range of fields, such as tourism in protected areas, exchanges of wildlife expertise and training exchanges for park rangers, are being carried out as well. The opportunities that countries are offering to one another regarding participation in national training courses are also of significance. Argentina has hosted trainees from several countries at its park-ranger training school in Bariloche, while Chile and Peru have provided instructors for courses held in Argentina when technical skills were not available locally. Similarly, Brazilian experts have taught wildlife conservation courses in Peru. These exchanges of personnel are carried out under a formula that requires relatively little funding, particularly in terms of scarce foreign-exchange reserves. Normally the country providing the specialist maintains the specialist's salary while he or she is assisting another country, and the recipient country provides living accommodations and takes care of other in-country expenses. Travel expenses are often covered through the network secretariat at the FAO Regional Office, but funding is also sought from other sources. While the exchange of personnel is important when addressing critical problems, it is the exchange of publications and documents on a regular and continuing basis that provides the greatest volume of information flow among the countries of the region. Research results, management plans and technical reports provide valuable information, and, for the first time, national experts are able to find solutions based on the experiences of their colleagues from other countries. The southern cone of Latin America often receives only limited international attention. It comprises a great variety of environments and ecosystems, however, ranging from the subtropical areas of the north, such as the Chaco region divided between Paraguay, Argentina and Bolivia, to the antarctic conditions in southern Argentina and Chile, with temperate and Mediterranean zones in between. This great variety of environments and unique ecosystems yields a special faunistic biological diversity that presents high endemism, phylogenetic complexity and species with a potentially high scientific value. Additionally, in the southern cone countries, there is a strong relationship between the exploitation of wildlife and the well-being of rural communities. These characteristics, and the accelerating deterioration of wildlife resources, make the development and implementation of plans and policies on wildlife a priority in this subregion. Legal mechanisms and sound administration to strengthen the conservation of the species, regulation of international trade, wise use of species and capabilities of wildlife institutions is crucial. For these reasons, and since many species are shared by two or more southern cone countries and because wildlife and products derived from them are traded between the countries, FAO and the network, in collaboration with the United States Fish and Wildlife Service, organized a meeting on wildlife of the southern cone countries to discuss the state of conservation and management of wildlife species. As a result of this meeting, a subnetwork on wildlife management for the southern cone countries was established with the objective of exchanging technical information on wildlife and working closely together to develop joint activities, explore new opportunities, tackle common problems and find sustainable solutions. The Latin American Technical Cooperation Network on National Parks, Other Protected Areas and Wildlife is proving to be an effective mechanism for finding solutions to common problems in the region. The work described above in relation to sustainable utilization of wildlife is only one facet of the total effort. Similar activities are being implemented for the other programme areas of the network. A high level of interest and enthusiasm has been generated, and today all Latin American countries are actively participating in one or another of the activities of the network. There are many challenges still to be met, however. Solutions are often found in establishing balances; for example, between agricultural land use and protected areas, traditional agriculture and wildlife use, and wildlife use and wildlife protection. The optimum will not be found in extremes, and each country must set its own priorities and find its own balances. Nevertheless, countries often face similar challenges, and it is here that the technical cooperation networks have their greatest potential.